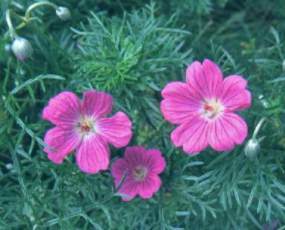 The carpet geranium is an ideal garden plant. It spreads and forms a dense carpet approximately 300mm thick and flowers almost all year round with a peak during the summer months. 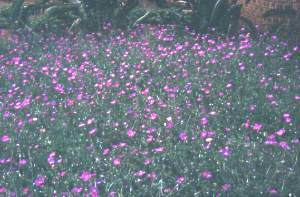 It has finely divided leaves which give it a soft texture in the garden. The mauve flowers have identical petals. It can be grown in full sun or semi-shade, although it does flower better and form a tighter carpet in full sun. Geranium incanum can be used very effectively on banks or as a colourful border plant, it is also very attractive when allowed to trail over retaining walls or garden pathways and steps. It is also equally useful in mixed borders, pots or hanging baskets. Geranium incanum is easily propagated from both seed and cuttings. Selected forms, such as those with darker coloured flowers, are best grown from cuttings. Fresh seed sown in spring or autumn is easily germinated and will produce a variety of darker and paler forms. Seed can be sown directly onto a well prepared seedling medium in trays and lightly covered. Once watering has been commenced the trays should never be allowed to dry out completely. Seedlings can be transplanted into separate containers once they are large enough to handle. The carpet geranium belongs to a large family (Geraniaceae) with about 700 species falling into 11 genera which include Geranium, Pelargonium, Monsonia, Sarcocaulon and Erodium. Plants from this family, especially geraniums and pelargoniums, have been hybridized and are widely cultivated the world over for their spectacular displays of flowers and striking colours. Pooley. E 1998. A Field Guide to Wild Flowers KwaZulu-Natal and the Eastern Region. Natal Flora Publications Trust: Durban. Van Wyk, B., Van Outdshoorn, B., Gerike, N. 1997. Medicinal Plants of South Africa. Briza Publications : Pretoria.